Heat oven to 425. Spread tortilla wedges on two baking sheets. Bake 5 minutes. Flip over. Spray with Pam, bake 5 minutes, until crispy. Heat oil in skillet. Add turkey and bell pepper. Cook until browned. Stir in tomato sauce and 1/3 cup water. Add taco seasoning. Cook 4 minutes. Reduce oven to 350. 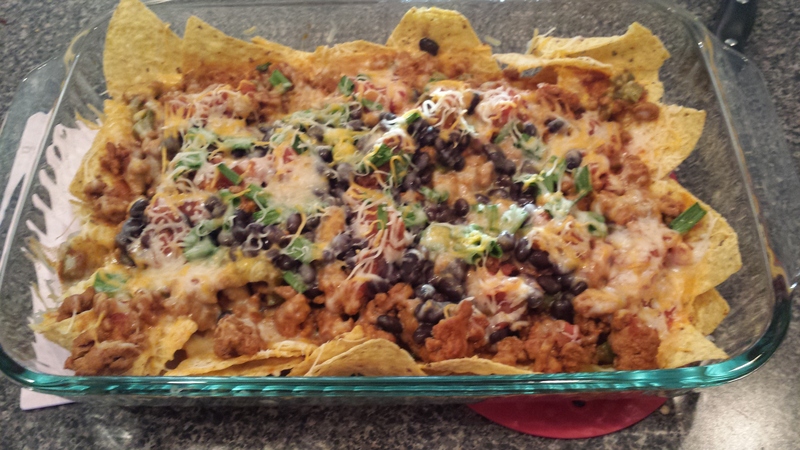 Line bottom and sides of a 9×13″ pan with tortilla chips. Spoon turkey mixture, beans and salsa over chips. Top with green onions and cheese. Bake 15 minutes until heated through and cheese is melted. Personal Review: I love nachos in almost any shape and form. Love them. So I was excited when I first came across this recipe in a Yahoo recipe group I belong to. Not going to lie, I was a little nervous about the ground turkey. However, I definitely recommend sticking with that (ground beef could easily be used in its place though). Either way, this recipe was really good. So, so easy! And the best thing … it was toddler approved in my house!